Make your own homemade uncrustable frozen PB&J sandwiches part of your weekly meal prep day… And YOU control the quality of the ingredients. Perfectly portable, great for road trips, vacation, as well as packed lunches! So I set out to figure out how to make homemade Uncrustables to stock my freezer. Sure, it’s easy enough to toss some basic peanut butter and jelly sandwiches in the freezer, but my kids prefer their sandwiches cut, crusts removed, and sealed. Plus keeping them from getting soggy when they’re defrosted is a bit of a challenge… But I have a solution to share! I’ve used the Pampered Chef Cut-N-Seal in the past, but I wasn’t thrilled with the very small sandwiches and large amount of wasted bread. I spied this sandwich sealer at Walmart the other day and figured at that price it was worth a try. Note that I found it on one of those vertical hanging holders in a random grocery aisle. I checked the kitchen gadgets sections and it was not stocked there. While it did fall short of the one-step sealing and cutting claim, after a bit of trial and error, it easily produced perfectly cut and sealed peanut butter and jelly sandwiches (and PB and honey for my picky 6 year old)! So what’s the secret to making awesome homemade uncrustables? 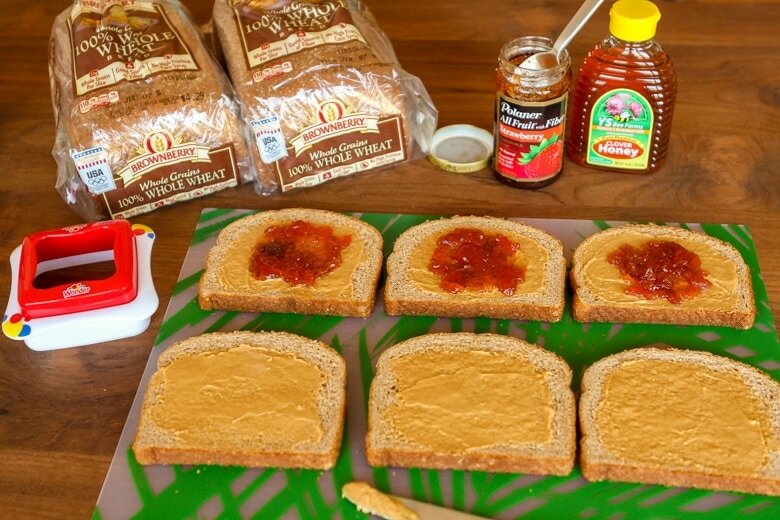 First things first — my secret to non-soggy thawed PB&J sandwiches. The key is spreading a thin layer of peanut butter on both slices of bread. The peanut butter acts as a sealant, which keeps the jelly from touching the bread and prevents the sandwiches from getting soggy when defrosted. Use about a tablespoon of jelly or preserves and keep it confined to the center of the bread. Be careful of using too much jelly — the contents will burst through the top of the bread during the cutting and sealing steps. This uncrustable maker is actually two separate pieces. I found that the sandwiches turn out the best when you cut and seal in two steps. Keep both pieces together and center them over your sandwich. Press down on the outside cutter piece to trim away the crusts and move them aside. Then press down firmly on just the center sealing piece to tightly seal the sandwich all the way around. Larger sandwich bread loaves work best because the sandwich won’t seal well if the crust is not completely trimmed off. The Brownberry Wheat slices I used gave mixed results. The center slices worked perfectly, but the slices closer to each end were just a touch too small to give a good seal. 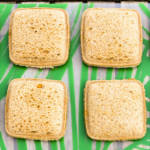 To freeze the sandwiches, simply lay them out individually on a cookie sheet and flash freeze them for about two hours. At this point you can transfer them all to a large freezer Ziploc bag or package them up in individual Ziploc sandwich bags. PIN IT NOW! CLICK HERE TO ADD THIS HOMEMADE UNCRUSTABLES RECIPE TO YOUR MEAL PREP RECIPES BOARD ON PINTEREST! Make your own homemade uncrustable frozen peanut butter and jelly sandwiches part of your weekly meal prep day… And YOU control the quality of the ingredients. Perfectly portable, great for road trips, vacation, as well as packed lunches! 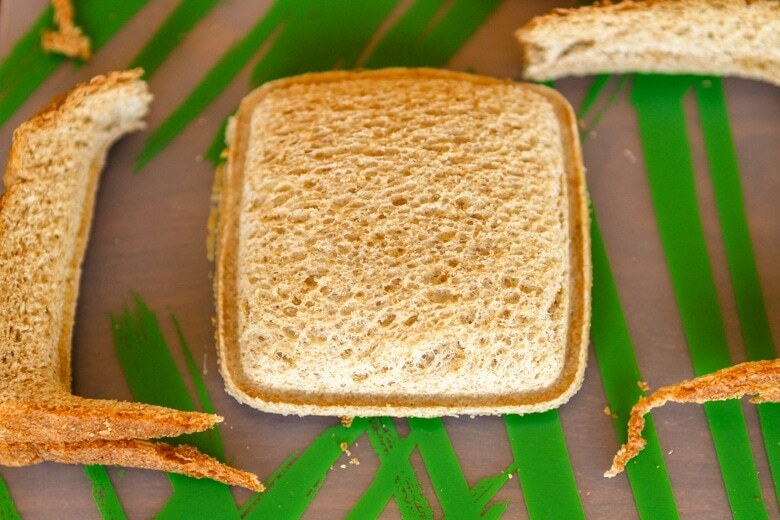 Spread a thin layer of peanut butter on both slices of bread. Place about one tablespoon of jelly or preserves in the center of the bread. Top the jelly slice with the peanut butter only slice. 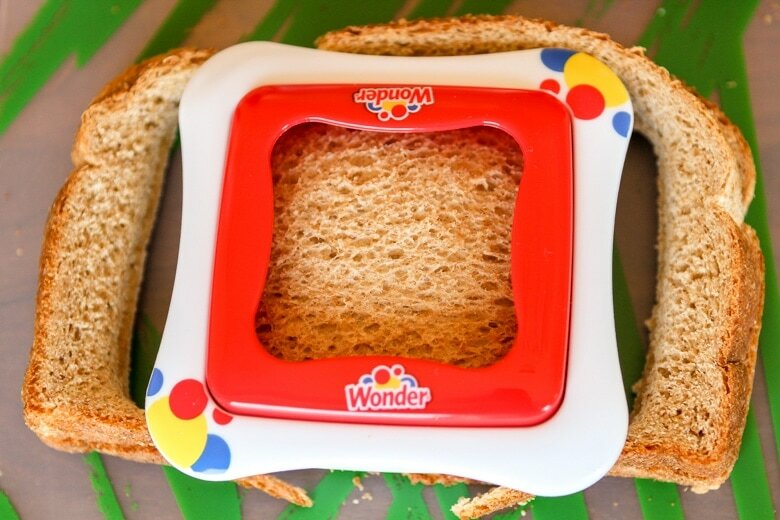 Center a sandwich sealer over both slices of bread. Press down on the outside cutter piece to trim away the crusts and move them aside. Then press down on the center sealing piece to seal the sandwich all the way around. 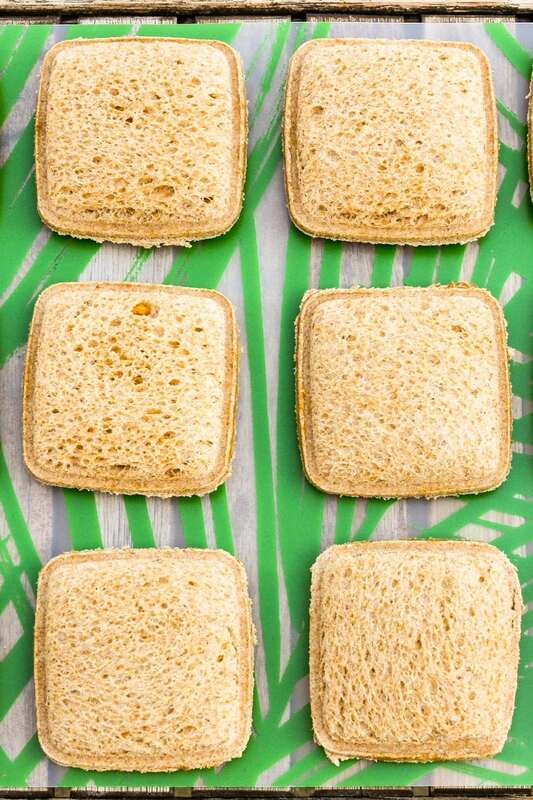 Lay the sandwiches out individually on a cookie sheet and flash freeze them for about two hours. Transfer them to a large freezer Ziploc bag or package them up in individual Ziploc sandwich bags. Sandwiches will thaw on their own by lunchtime, or you can put them in the microwave for 15 seconds to thaw. We make a point of making a boatload of these homemade uncrustables during our weekly meal prep sessions. It saves a ton of time and money throughout the week. Now I have a freezer full of homemade uncrustables for easy lunches for my on the go kids! They thaw easily on their own in a packed lunch or toss them in the microwave for 15 seconds. Plus I love that I can control the quality of the ingredients in their sandwiches versus the store bought products. Now to figure out what to do with all of the crusts… A French Toast Casserole perhaps? I’d love to see how your homemade uncrustables turn out… Tag me @Unsophisticook on Instagram or use the hashtag #Unsophisticook so I can check it out. Enjoy! Have anyone tried it with cheese and lunch meat with mayo or mustard on the bread? How about tuna or chicken salad? I don’t have much room in my freezer to freeze them on a pan. Will they stick together if I freeze them in a Ziplock? Any suggestions? Hi Adam! I actually haven’t frozen them any other way. I think I’d just layer them with some wax paper between to ensure they don’t stick together, and you should be able to reuse the wax paper several times.